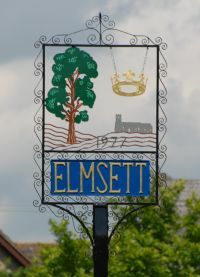 Elmsett boasts an attractive village green with a village sign and a large chestnut tree where once the village smithy had his forge. Opposite St Peter's Church at the North Eastern edge of the Village is the Tithe Memorial. The Street is the hub of village activity where the Post Office Stores and Rose and Crown Public House face the playing field, known as ‘The Meadow'. Close by are the Primary School and the Village Hall. In addition to St Peter's Church of England, Elmsett has a Methodist Church, a Pre-School Playgroup and Stepping Stones group and also several clubs who regularly use the Village Hall which is also available for private hire. Details of Village acivities are contained in the monthly Elmsett and Aldham Newsletter . Elmsett Airfield is situated at the most westerly point of the village. The Elmsett Airfield Liaison Group meet half yearly in March and September to recieve a report on activities and to discuss any matters arising.